A person can make serious money with a home cleaning business or, as some prefer, housekeeping services, as you’ll see. Spring-cleaning doesn’t just refer to the months of March, April and May. No, the home cleaning business is a lucrative year-round part time or full time opportunity. To start your spring cleaning service you can follow the lead of Bernice of Great Falls, Montana who started cleaning houses about 31-months ago. I chatted with her recently about getting started. What follows is a summary of her story. She spent a little over $64 for cleaning supplies and a hand held basket to carry them in. She went on Craigslist and purchased a good used vacuum cleaner for $99. Next, a friend of hers made business cards off of her computer, which Bernice promptly pined on bulletin boards in stores all over town. She was able to leave her cards at two laundrymats in town and at various independently owned businesses. Bernice told me that she was not a person who wanted to wait around in hopes jobs would come her way. Nope. She contacted apartment managers, home remodelers, building contractors and elderly home care social service agencies giving each one of her cards. All this marketing took activity took 14-days of legwork. Actually, on the 11th day she got a house-cleaning job as a result of her card she posted at a neighborhood food market. On the 16th day, the 17th day, the 24th day and by day 30, Bernice celebrated her new spring-cleaning service with a total of 9 cleaning jobs. Of these, two were from apartment managers, three from social service agencies and four turned out to be bi-weekly housekeeping jobs. Bernice recalled that by the end of the first year of business, after car and supply expenses, she made a little under $18,000; the second year $31,800 and is on tract this year to make $39,000. She is seriously considering contracting with two or three part timers to cover all the work that is coming her way. She, obviously, would make money off each job they perform. Bernice’s objective is to have five part time cleaners working for her and to create enough spring-cleaning service clients to generate $100,000 per year in earning for her. She figures she is about two years or so away from achieving that goal. While Bernice has yet to perform all these different jobs, her business, ”Bernice Spring Cleaning Service,” offers these 12-services, which are far more than larger cleaning companies offer. To perform some of these activities, she contracts work out to various individuals and cleaning businesses. You may easily incorporate some or all of these 12-services into your own cleaning business. 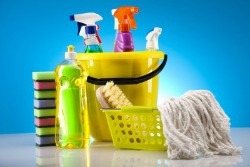 In the beginning, Bernice relied on these 3 top-notch resources to learn the various aspects of the cleaning business. Starting a Cleaning Business: The focus here is what you need to know about professional home cleaning services, short-cuts and resources to make the job quicker and better. Instant Office Cleaning Kit: Has a ton of info about the commercial cleaning marketplace and how to start such a service. How to clean fast, better and most effectively is always the objective.